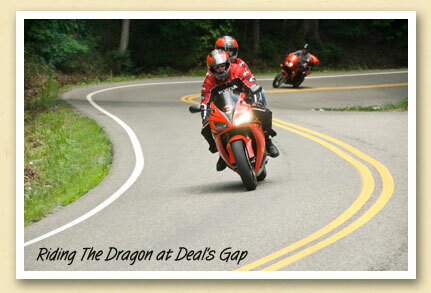 The Dragon — the curvy stretch of US Highway 129 connecting North Carolina and Tennessee at Deal’s Gap — elicits contrasting responses from visitors to the Smoky Mountains. “Flatlanders”, unaccustomed to serpentine roads, have been known to turn several shades of green after negotiating the road’s 318 continuous curves in just eleven miles. But motorcyclists love it, and consider it one of the best motorcycling and sports car roads in the world.